Peace. Mercy and the Blessing of Allah be upon you. I have already had the honour to submit to Your Majesty’s consideration my desire to become a Moslem and to abandon other religions...I beg you to accept my conversion to Islam which springs in me from grounds of belief, reflection, wisdom and good intention. Allah the Almighty guides to the right path. There can never have been a more impertinent letter in the history of Wahhab conversions because Harry Philby intended to do what few others considered; to embrace Wahhabism, not only a religion but a political and economic autocracy. This time his impudence worked and The King telephoned him personally to say that he would permit the entrance of Philby into Islam and instructed him to leave immediately for Mecca for a ceremony. On the pilgrim’s trail to Mecca he was met by Fuad Hamza, who advised Ibn Saud on foreign affairs. Hamza set up a tent where Philby performed the ritual ablutions and they continued on their way to Mecca. There, Philby kissed the black stone of the Kaabah and drank from the well of Zamzan before he turned to the east with the holy pledge, “I testify there is no god but God; and that Mohammed is his servant and prophet” – the words inscribed on the first Saudi flag. Afterwards they went to meet the King in Taif who bestowed on Philby the name Abdullah – Slave of God. More important, the King told the gathered party that Harry Philby was a worthy Muslim and because of his dedication to the Wahhab kingdom would sit with his Privy Council. The King wanted Harry as a dedicated Wahab servant to do his will. The following year, in April 1931, Philby accompanied The King in person on the Hajj, or great pilgrimage, which was a major honour. These devotions helped him on his quest to become Ibn Saud’s grand vizier –an advisor to the throne. This news caused concern with officials in the British world who knew of Harry’s revolt against the British establishment. The British Consul in Jiddah reported that Philby was at odds with British policy in The Middle East and believed in the restoration of an Arab Empire under a single leader who must be Ibn Saud. The Consul warned that as a member of the Looking Back | The King's Man 22 Privy Council, Philby was in a position to harm British relations with The King. Moreover, Philby spoke the King’s Nejd dialect, which was scarcely intelligible to other Arabic speakers. But Ibn Saud was his own man and while he was a true friend and supported Philby, he had particular reasons for Harry’s membership of the Privy Council - Philby had the ears of the mightiest politicians in Britain. The reality was that he was the only conduit in both directions and what information he passed either to The King or British diplomats was one-sided. Ibn Saud understood this and managed the information he allowed Philby to pass to Britain. 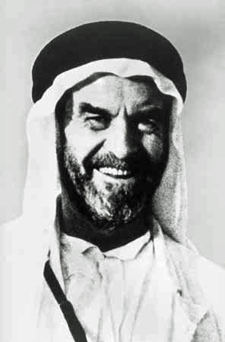 The second test of trust by The King concerned Philby’s frustrated ambition to cross The Rub al-Khali or Empty Quarter of Saudi Arabia and it caused the most significant discord in their long relationship. Philby’s lifetime aspiration was to be the first Westerner to explore The Empty Quarter of Saudi Arabia. He cherished the thought that if he succeeded he might be knighted, by the establishment he despised, when he returned to London. To think about a knighthood, he must be first across a wilderness the size of Texas and he needed the permission of Abdul Aziz to make the trip. Insistent, Philby implored The King for permission to mount his Looking Back | The King's Man expedition and again and again it was withdrawn at the last minute. Philby was at a loss to understand the motives of The King he admired so much and the final bitter blow came when he learned that a former assistant, Bertram Thomas, had completed the journey in the opposite direction from Salalah to Qatar. He was slightly mollified when the deputy foreign minister, Fuad Hamza told him The King had withheld his consent for so long because of his fear the he might lose Philby’s services that were desperately needed as a counsellor – he feared that Philby might never survive The Empty Quarter. The King’s mind was on oil and he recognised Harry’s value in negotiating a deal that could benefit his country. Diplomatically, Ibn Saud allowed Philby to organise the trip and provided guides, camels, safe passage and paid all the bills. Harry Philby left Hufuf on 7 January 1932 and by the end of February dignitaries in Jiddah and in London presumed him dead. Two weeks later on March 14, burned black by the sun and totally emaciated he turned up at the oasis of Sulaiy. He had conquered the wilderness but was barely alive. When he recovered, Harry couldn’t wait to travel home to London to receive the plaudits of The Royal Geographical Society, read The Times and watch cricket. As much as he expressed contempt for British society, he enjoyed participating in its activities. On the 27th of September 1932 Abdul Aziz united the Hejaz and Nejd regions into The Kingdom of Saudi Arabia over which he reigned as King. Early versions of the Kingdom’s dark green flag were decorated with crossed swords under a palm tree and an affirmation in white script “There is no god but God; Mohammed is the prophet of God.”...words that Harry Philby had pledged at Mecca. In February 1933 negotiations over oil concessions started in earnest with Philby pulling the strings on behalf of The King. Philby knew the limitations imposed on Iraq Petroleum who represented the British interest with a maximum down payment of £10,000. The American interest of Standard Oil offered a down payment of £35,000 if a concession was granted. In addition another payment of £20,000 was payable in eighteen months plus a yearly rental of £35,000. The cards were stacked and Philby even persuaded Andrew Ryan, the first British Minister to Saudi Arabia that it was better to advise the Saudis to accept the American offer because it was most unlikely there was oil there anyway. Also Standard Oil’s shrewd lawyer, Lloyd Hamilton put Philby on an indefinite retainer of 1,000 dollars a month. There could only be one decision and it went in favour of Standard Oil. Philby achieved the political decision he sought to humiliate the British and Ibn Saud achieved the commercial decision that would define the future of his Kingdom. Commercial quantities of oil were discovered on the Dammam Dome (Jebel Dhahran) in March 1938. Well number 7 was a deep test well and found biogenic limestone porous enough to hold oil and gas and the taps were turned on. After hostilities began in World War II, Philby’s disloyal comments about Britain to the Privy Council prompted its other members to comment that he used his words to cover his role as a British spy at court. For the British intelligence services, who were on high alert because of the war, his comments attracted the opposite kind of attention - they might be regarded as treason. Philby’s scornful remarks about Britain alarmed Ibn Saud so much that he told the British authorities of Harry’s intention to travel abroad and spread anti-British propaganda. Philby was arrested on the 29th July 1940 in Bombay, shipped to England and imprisoned. He remained locked up until February 1941 when he was released as a ‘dotty fanatic’ but his passport was withheld until the end of the war and returned when Ibn Saud asked him back to Jiddah without delay. He sailed to Alexandria and was picked up by Ibn Saud’s private DC3; a present from President Roosevelt. In July 1945, Harry was back in The Privy Council and The King’s Man again. When Harry was arrested in 1940, oil output was 5.1 million barrels and remained steady through World War II. Extra money came from Great Britain and the USA. To maintain their relationship with Ibn Saud and with Philby’s clever politicking, the British Government granted subsidies that rose to £1m a year. But the major contribution came on 18 February 1943, in the form of Lend-Lease funds of $33m in cash and goods from the USA as well as advances in royalties. As war ended, funds quickly dried up. 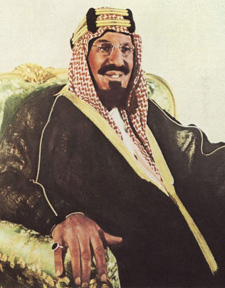 Though oil production exploded to 60 million barrels in 1946, the Saudi treasury was still short of income. By 1951 Saudi oil revenue was $110m which included half of Aramco’s profits and in 1952 went past $150m. Harry’s personal fortunes improved in leaps and in 1950 he won a £400,000 contract to build a palace in Riyadh where The King gave him a house. He still maintained contact with the British Secret Service but just to keep them informed of The King’s health which was worsening. When The King died at his palace in Taif in 1953, his body was returned to Riyadh and by Wahabi custom, buried in an unmarked grave. In time, people even forgot where The King was buried but his legacy as a truly great leader was enduring. In Wahabi tradition, Harry did not grieve for The King but nevertheless reflected for the rest of his own life on their 35 year liaison. Abdul Aziz bin Abdur Rahman bin Faisal al Saud conquered and created his Kingdom by bravery, shrewdness, audacity and the huge force and charm of his personality. These qualities found uniquely in a single human being were why Harry St. John Bridger Philby was, and always would be, The King’s Man. Editor's Note: Mel Trotter lived in Dhahran in the ‘70’s and flew Royal, corporate, Tapline and exploration work. He was a pilot in the Aviation Department – believed to be the first English one where the others were all American at that time with Aramco. A writer and executive coach, he now lives in Wilmslow, Cheshire. Mel’s latest novel The Orphan Sniper is available in paperback at The Amazon Store and as an eBook on Kindle and compatible devices. To order - Amazon US http://amzn.to/2r4Aiw3 or Amazon UK http://amzn.to/2poMThy. He can be contacted through his website at www.humanriskfactors.com. This article was first published in Aramco Overseas Company's Alaela magazine. Permission to reprint granted by Mel Trotter.